Ricky Amos (left) and Richard Jones (right)/Images via Kansas Department of Corrections. In 1999, Richard Anthony Jones was given a mandatory sentence of 19 years after a witness identified him as one of three men who had stolen her cell phone in a Walmart parking lot. On Thursday, he was released after proving that he has a doppelganger with the same first name who lived near the scene of the crime. The Kansas City Star reports that two years ago, Jones contacted the Midwest Innocence Project and the Paul E. Wilson Defender Project at the University of Kansas after hearing that another inmate at Lansing Correctional Facility resembled him, and had the first name “Ricky.” Jones has always vehemently asserted his innocence, saying he was with his family at the time the woman was robbed, in his home across state lines. 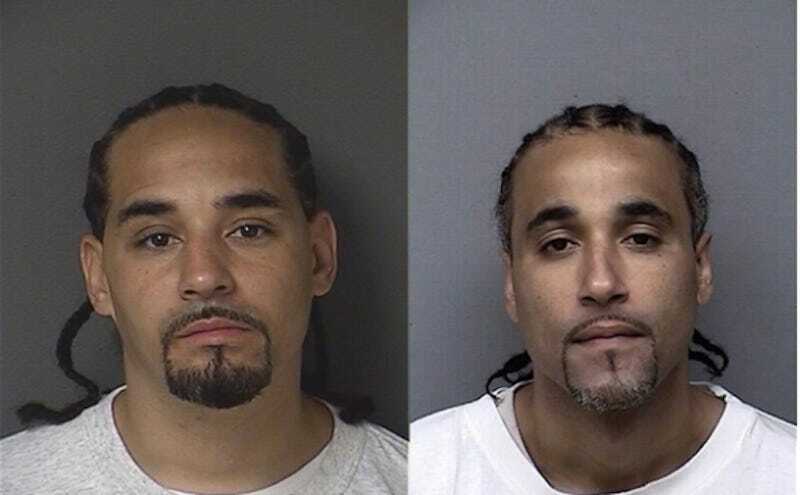 In booking photos, the two men looked nearly identical, with the same facial hair and cornrows. They are both close to 6-feet-tall and weigh around 200 pounds. The two men are also roughly the same age: Jones was born in 1976, while Kansas corrections records show Ricky Lee Amos was born in 1977. But only Amos had been linked to the address where the crime began: a drug house where he briefly lived with his mom after the family was evicted from their place around the corner. That same house was where two men told police they picked up ‘Rick’ and drove to Walmart that fated day of the robbery in 1999, the three men looking for a way to make fast cash. On Wednesday, Johnson County District Judge Kevin Moriarty heard new testimony from witnesses who could no longer say definitively if the perpetrator had been Jones or Amos. Amos denies that he committed the robbery, and while Judge Moriarty was unwilling to say that Amos was responsible, he ruled that “no reasonable juror would have convicted Jones” if presented with this new evidence. At the time of her identification, the victim admitted to not having seen her attacker’s face and “relied mostly upon skin tone” when choosing the police photo of Jones. She has since admitted that “the person that most likely looks like the individual committing the robbery [is] Mr. Amos.” Remarkably, Jones says seeing a photo of Amos helped him to understand the miscarriage of justice he’s suffered under for the last 17 years. On Thursday, Jones met his granddaughter for the first time, and greeted his 17-year-old, who he hasn’t seen since she was a toddler.